Jasmine or Jessamine is any of the more than two hundred species of shrubs and vines comprising the plant genus Jasminum of the olive family (Oleaceae). The term also refers to the perfume made from these plants. Jasmine is native to tropical and warm temperate regions of the Old World, chiefly Asia, with some species native to all continents except Antarctica and North America. It is widely grown throughout the tropics as an ornamental plant for its strongly scented flowers. Jasmine flowers are used in decorations and in producing jasmine tea, and the flagrant flowers are used in aromatherapy. In Thailand, jasmine flowers are used as a symbol of the mother, and in Indonesia the flower symbolizes purity, eternal life, nobility, and the beauty of a girl. It is the most important flower in wedding ceremonies for ethnic Indonesians, especially on the island of Java. 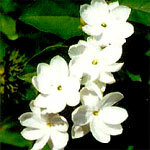 Jasminum molle, commonly known as Indian Jui, is used as sacred offerings during Hindu religious ceremonies. Some flagrant-flowered species of plants of other genera also use the common name of jasmine, including confederate or star jasmine (Trachelospermum), cape jasmine (Gardenia jasminoides), and night-blooming jasmine (Cestrum nocturnum). Carolina jasmine (Gelsemium sempervirens), also known as false jasmine or yellow jasmine, contains toxic alkaloid components which can be lethal in small doses. A double-flowered cultivar of Jasminum sambac in flower with an unopened bud. The flower smells exactly like the tea as it opens. The majority of jasmine species grow as climbers on other plants or on structures. The leaves can be either evergreen or deciduous and are opposite in most species. The leaf shape is simple, trifoliate, or pinnate, with up to nine leaflets. Jasmine flowers are generally white, although some species have yellow flowers. Unlike most genera in the Oleaceae, which have four corolla lobes ("petals"), jasmines often have five or six lobes. They are often strongly and sweetly scented. Flowering is in spring or summer in most species, but in a few species, notably J. nudiflorum, flowering is in winter on the bare branches of this deciduous species. Jasmines are widely cultivated for their flowers, which are enjoyed in the garden, as house plants, and as cut flowers. The flowers are worn by women in their hair in southern and southeast Asia. Many species of jasmine also are used to yield an absolute, which is used in the production of perfumes and incense. Similar to essential oils, absolutes are concentrated, highly-aromatic, oily mixtures extracted from plants. Whereas essential oils can typically be produced through steam distillation, absolutes require the use of solvent extraction techniques. Jasmine tea is produced from dried flowers, particularly of Arabian jasmine (Jasminum sambac). This tea which often has a base of green tea, but sometimes an Oolong base is used. Jasmine tisane (any herbal infusion other than from the leaves of the tea bush) is consumed in China, where it is called Jasmine flower tea (茉莉花茶; pinyin: mò lì huā chá). Some claim that the daily consumption of jasmine tea is effective in preventing certain cancers. The delicate asmine flower opens only at night and is plucked in the morning when the tiny petals are tightly closed. They are then stored in a cool place until night. In the evening, as the temperature cools, the petals begin to open. Flowers and tea are "mated" in machines that control temperature and humidity. It takes four hours or so for the tea to absorb the fragrance and flavor of the Jasmine blossoms; for the highest grades, this process may be repeated as many as seven times. Because the tea has absorbed moisture from the flowers, it must be refired to prevent spoilage. The spent flowers may or may not be removed from the final product, as the flowers are completely dry and contain no aroma. If present, they simply add visual appeal and are no indication of the quality of the tea. Several jasmines serve as national flowers of their nations. Jasminum officinale is the national flower of Pakistan, where it is known as the "Chameli" or "Yasmine." In Sanskrit, it is called "Mallika." Jasminum sambac is the national flower of Indonesia, where it is known as "Melati," and of the Philippines, where it is known as "Sampaguita." In Indonesia (especially the island of Java), it is the most important flower in wedding ceremonies for ethnic Indonesians. 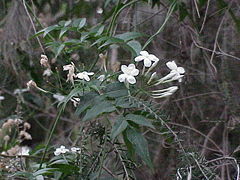 J. fluminense is an invasive species in Hawaii, where it is sometimes known by the inaccurate name "Brazilian Jasmine." J. dichotomum is also invasive in Florida. Jasminum molle, commonly known as Indian Jui, is not very common though it deserves a special attention. The flower is held sacred to all forms of Goddess Devi and is used as sacred offerings during Hindu religious ceremonies. J. molle is a small, bushy plant with simple ovate dark green small leaves and powdery satin white flowers. Possessing a strong gardenia-like scent, flowers appear in bunches from summer to fall. It is very easy to grow, and takes both sun and shade, dry and moist conditions, and thus is popular for a scented garden or as indoor plant. Jasminum sambac. In Philippines, "sampaguita"; in Indonesia, "melati"
Jasminum sambac (Nyctanthes sambac), also known as Arabian jasmine, is a species of jasmine native to southern Asia, in India, Philippines, Myanmar, and Sri Lanka. It is widely grown throughout the tropics as an ornamental plant for its strongly scented flowers. Numerous cultivars have been selected, including some with double flowers, such as "Duke of Tuscany." The flower of Jasminum sambac is processed and used as the main ingredient in jasmine tea. J. sambac is an evergreen plant that reaches up to one to three meters in height. The leaves are opposite or in whorls of three, simple (not pinnate, like most other jasmines), ovate, 4 to 12.5 centimeters long and 2 to 7.5 centimeters broad. The flowers are produced in clusters of three to 12 together, strongly scented, with a white corolla 2-3 centimeters diameter with five to nine lobes. The flowers open at night, and close in the morning. The fruit is a purple-black berry one centimeters in diameter. In addition to Arabian jasmine, common names include Mogra (Hindi), Kampupot, Melati (Malay and Indonesian Language), Sampaguita (Tagalog), and Mallipu (Tamil). Jasminum sambac is the national flower of the Philippines, adopted by its government in 1937. In the Philippines, the flowers are gathered and strung into leis, corsages, and crowns or its oils distilled and sold in stores, streets, and outside churches. The garlands may be used to welcome guests, or as an offering or adornment in religious altars. It also is the national flower of Indonesia, being adopted by Indonesian government in 1990, along with Moon Orchid (Phalaenopsis amabilis) and Rafflesia arnoldii. In Indonesia, the flower symbolizes purity, eternal love, and nobility. It also symbolizes the beauty of a girl. The flower is commonly used in religious or cultural ceremony especially in Java and Bali. In Indonesia (especially the island of Java), it is the most important flower in wedding ceremonies for ethnic Indonesians. It is nicknamed puspa bangsa (nation flower or people flower) by the government. In Hawaii, the flower is known as "pikake" or "pikaki," and is used to make fragrant leis. In South India, jasmines are strung into thick strands and worn as a hair adornment. Ito, Y., A. Sugimoto, T. Kakuda, and K. Kubota. 2002. Identification of potent odorants in Chinese jasmine green tea scented with flowers of Jasminum sambac. Journal of Agricultural and Food Chemistry 50(17): 4878-4884. Rohwer, J. G. 1997. The fruits of Jasminum mesnyi (Oleaceae), and the distinction between Jasminum and Menodora. Annals of the Missouri Botanical Garden 84(4): 848. Sadhu, S. K., M. s. Khan, T. Ohtsuki, and M. Ishibashi. 2007. Secoiridoid components from Jasminum grandiflorum. Phytochemistry 68(13): 1718-1721. This page was last modified on 2 April 2008, at 09:48.